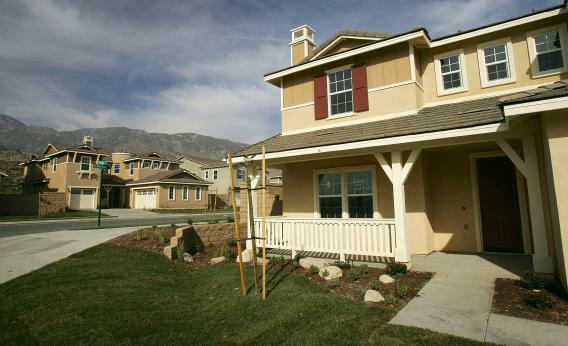 RANCHO CUCAMONGA, CA - JANUARY 29: Newly constructed homes are shown January 29, 2007 in Rancho Cucamonga, California. Something a little bit crazy is happening in the American mortgage market. So called “jumbo” loans that are too big for Fannie Mae or Freddie Mac have gotten cheaper than the conforming loans the GSEs buy. To see how strange this is, go back to the purpose of these Government Sponsored Enterprises. They exist to ensure that 30-year fixed rate mortgages will be a widely available tool for homebuyers, and they accomplish that by offering banks guarantees against the risk of default. At the same time, in order to prevent the GSEs from becoming a totally farcical giveaway to the rich there are limits on how big a loan the GSEs can buy. That’s $417,000 in most of America but rises higher in expensive coastal markets. The way this has always always always worked is that loans that meet Fannie/Freddie standards are somewhat cheaper than the loans that don’t. So how did the streams get crossed? As can see, it’s been a result of the conforming rate rising slightly faster than the non-conforming rate, even as both have risen sharply. They’ve risen because the Federal Reserve has been talking about “tapering” its Quantitative Easing purchases of Fannie and Freddie’s mortgage-backed securities. That ought to directly push up the rates on conforming loans, and then indirectly push up jumbo loans by the same amount. But concurrently with this taper-driven trend two other things have happened. One is that the federal agency that oversees Fannie and Freddie has been pushing up the fees that banks charge. The other is that banks have been pricing their jumbo loans more aggressively, because they see jumbo loan targets as whales. The idea is to get your hooks into a high income household with an expensive house via a mortgage loan, and then cross-sell them on stock brokerage and other services. So regulators have been pushing the cost of confroming loans up, while cross-sellers have been pushing the cost of jumbo loans down. This situation probably won’t last very long. Banks don’t have to sell their non-jumbo loans to Fannie and Freddie. They do so because it’s advantageous. But what makes it advantageous is the ability to offer customers a lower rate at a reasonable risk. If Fannie/Freddie fees get so high that the interest rate spread vanishes, then there’s no point. Policymakers and markets ought to adjust and bring some kind of gap back into existence.